Featuring Crossholder from Hungary, who have been touring all around with a flavorful sound reminiscent of the 80′s, with originals and covers of Iron Maiden. 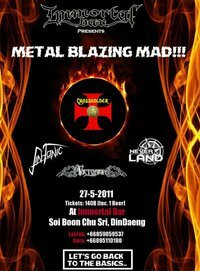 Sin Tonic – A new Heavy Metal act from Bangkok with an old school sound. Neverland – Melodic Power Metal meets the 90′s glam metal. Victorium – Will take you on a Power Metal ride!! !